In a large saucepan of boiling, salted water, add farro and cook until tender, roughly 20 to 30 minutes if using "pearled" farro, or 45 to 50 minutes if using "whole" farro. Drain well and place cooked farro into a large bowl. While the farro cooks, chop broccoli florets into bite-sized pieces. Peel stem lengthwise, then cut crosswise into 1/4" thick slices. On a large baking sheet, add florets and sliced stem pieces - drizzle with 2 tablespoons olive oil and season with salt and fresh ground black pepper. Toss to coat, then place into the oven and roast until tender and browned in spots, about 20 minutes. 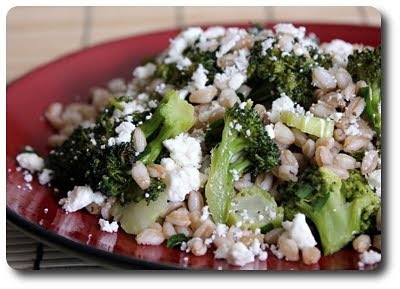 Slide cooked broccoli into the bowl with the farro, followed by the feta, scallions, crushed red pepper and parsley. Sprinkle mixture with vinegar - toss to coat, then season with salt and pepper to taste. Drizzle with remaining tablespoon of olive oil, then toss again. Before serving, taste once more and add additional vinegar, if needed. Just found the recipe? Want to know what we thought about it? Click here to see where we talked about it!